On August 6, 1945, the bomb doors on the Enola Gay opened above the Japanese city of Hiroshima. An atomic bomb packed with 60 kilos of uranium fell for less than a minute before exploding with the energy of thirteen thousand tons of TNT. 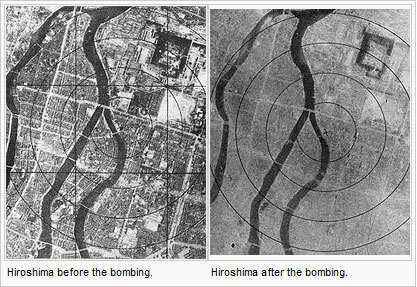 The radius of "total destruction" extended a mile in every direction. The force of the blast killed an estimated 70,000 people instantly. Unnoticed by the world at the time, the Enola Gay was also releasing a much more subtle threat to humanity: an invisible, odourless and tasteless gas called carbon dioxide. Even today, a third of Enola Gay’s CO2 from that mission is still up in our atmosphere and around a sixth will be there for millennia. Most of the CO2 that does leave the atmosphere dissolves into our oceans, acidifying them. "...equivalent to exploding 400,000 Hiroshima atomic bombs per day 365 days per year. That’s how much extra energy Earth is gaining each day." That's 278 atomic bombs worth of energy every minute – more than four per second -- non-stop. To be clear, that is just the extra energy being gained each day on top of the energy heating our planet by 0.8 degree C. It is the rate at which we are increasing global warming. Even if we stopped burning all fossil fuels tomorrow, our past CO2 emissions will continue to add hundreds of thousands of A-bombs worth of energy each day for years. Global temperatures will continue to rise and extreme weather events will continue to get more extreme for decades. It will take nearly a century for enough of this CO2 to be removed from our atmosphere to return our planet back to the temperatures and weather energy levels we are experiencing now. The weather right now is tamer than it is going to be in any of our lifetimes. We have a lot more heat, energy, damage and misery already "in the pipeline" from our past emissions. But of course, we aren’t stopping fossil fuel emissions tomorrow, are we? In fact, most people are doing just the opposite, burning more every year. "The stark reality is that global emissions are accelerating and new efforts are underway to massively expand fossil fuel extraction, by oil drilling to increasing ocean depths, into the Arctic, and onto environmentally fragile public lands; squeezing of oil from tar sands and tar shale; hydro-fracking to expand extraction of natural gas; and increased mining of coal." In BC, we are rapidly expanding production of fracked gas and of coal. We are also seeing multiple large pipelines and super tanker projects being pushed through to allow tar sands extraction to expand more rapidly. BC’s total carbon economy – exports plus burning – is exploding. Our BC Liberal government, led by Premier Christy Clark, is approving and promoting these huge increases in carbon extraction. Hansen also just published a widely-read New York Times article titled "Game Over for the Climate" that opens with the following statement: "Global warming isn’t a prediction. It is happening." The effect of adding another 278 A-bombs worth of energy every minute is turbo-charging our weather to the point where it is now spinning off one record extreme event after another. Hansen predicted back in 1981 that unrestricted fossil fuel burning would turbo-charge our weather to the point that around 2010 extreme weather events would become frequent and obvious. Sure enough, the weather data shows this is happening. In a peer-reviewed article about to be published, Hansen proves that many of the extreme weather events in the past few years were "caused by global warming." Time magazine got the exclusive preview: "Global Warming: An Exclusive Look at James Hansen’s Scary New Math"
We find ourselves now at a transition point in which climate change is shifting from an intellectual idea to an in-our-face physical weather threat. As Hansen points out, we are literally accelerating into that extreme weather threat at the rate of 400,000 A-bombs worth of new energy every day generated by our past emissions. Instead of backing off the accelerator by cutting down on dirty fuel extraction we are pressing the pedal to the metal by rapidly increasing dirty fuel extraction. Future generations -- as well as current ones -- will not be happy with where this is going. Warmer air can hold more water. Last year, NASA said satellite measurements showed it rained so hard around the world that the oceans fell. One of the most recent of these epic floods happened in Thailand. This one weather bomb wiped out 18 per cent of their GDP. To understand what that means, consider that the tar sands are 2 per cent of Canada’s GDP. It was an economic disaster 35 times greater than anything in their history. Last year, Hurricane Irene became the most damaging category 1 hurricane in US history, doing $15.8 billion in damages. Covered bridges that had withstood everything nature had thrown at them for over a century were swept away like match sticks. It was the third 500-year climate event in the last twelve months in the region. According to research by Hansen and others, extreme heat used to cover less than 1 per cent of our earth’s surface. But our CO2 has now cooked 10 per cent of our planet into "extreme heat" conditions at any given point in time. "We can say with high confidence that the recent heat waves in Texas and Russia, and the one in Europe in 2003, which killed tens of thousands, were not natural events — they were caused by human-induced climate change." Russia had to cut off grain exports for over a year, driving up food prices globally. Texas lost billions of dollars and saw their cattle and rice industries decimated. It was drier than any year of the great Dust Bowl. Mexico reports that 40 per cent of the country's agriculture has been destroyed. This March, an unprecedented heat wave swept much of North America, setting 15,000 high temperature records in a single month. So extreme was this heat that 21 locations broke century-old, all-time-hottest temperature records – during the coldest point in the night. The low for the day was hotter than any previous high. This just doesn’t happen. Or at least it didn’t happen in our old climate. Now we have a climate on atomic steroids. Twenty-five US states recorded their hottest March in 116 years of record keeping. The freak heat caused fruit trees in Ontario and Quebec to bloom weeks early, only to be hit by a brief cold snap. Already, 80 per cent of the apple crop in these regions has been destroyed. It turns out that food crops just don’t like freak weather. Off our west coast, wave buoys are reporting that extreme wave heights have been increasing one foot every three years. Record smashing low-pressure storms have been sweeping across North America from the Midwest to Alaska. A record low pressure storm last year raised sea levels up to two feet in our area just from the lack of pressure pushing down on the ocean. The south Atlantic used to be too cold to produce hurricanes. Not any more. Rising ocean temperatures in the last few years have passed a critical threshold and the first two hurricanes have formed off Brazil. That’s more than just a new weather record, that’s a whole new category of extreme weather. The winds have to be strong enough to hurl large hunks of ice thousands of feet upwards to gain layer after layer of ice. Sure enough, extreme hail records are being set in our new turbo-charged climate. Hawaii isn’t a place where giant hail forms. In fact, only eight times has hail the size of a penny or quarter been recorded for the islands. There were no records for hail larger than an inch until a freak supercell thunderstorm formed there on March 9, 2012. This pumped out a hail storm full of 2 to 3 inch diameter hail with at least one that was the width of a grapefruit -- 4.5 inches. The two largest hailstones in US record keeping were both formed in 2010 super storms. An 8-inch hunk of ice hit South Dakota in July and a 7.75 inch hunk landed in Kansas in September. If you want to see an amazing video of a recent hail storm in Oklahoma, click here. The stunning extremes we witnessed gives me concern that our climate is showing the early signs of instability ... We’ve bequeathed to our children a future with a radically changed climate that will regularly bring unprecedented weather events–many of them extremely destructive–to every corner of the globe. This year’s wild ride was just the beginning. Writing about March’s freak heat wave he said simply: "This is not the atmosphere I grew up with." It was hard for me to grasp “400,000 atomic bombs worth of energy” beyond a sense of 'really, really big'. So I decided to break it down into smaller chunks to see how it relates to my everyday world. Alberta tar sands: Past tar sands carbon is accelerating our climate forward at the rate of 1,300 A-bombs worth of energy each day. Industry’s and Alberta government’s goal is to double tar sands carbon extraction by the end of this decade and triple by 2035. BC CO2 emissions: Past fossil fuel burning in BC is accelerating our climate forward at the rate of 1,100 A-bombs worth of energy each day. The Clark government is halting carbon reduction policies while pushing huge increases in BC carbon extraction. Note also that the Alberta tar sands have now produced more carbon than all fossil fuels ever burned in BC history. BC Coal: Past BC coal carbon is accelerating our climate forward at the rate of 600 A-bombs worth of energy each day. Industry and our current provincial government plan to significantly increase extraction of BC crown-owned coal. Canadians have dumped 2.2 per cent of the global CO2, making our national share from past emissions equal to 8,680 a-bombs worth of energy each day. That is 360 per hour. Six per minute. One every 10 seconds. Both our past and our on-going emissions are among the highest in the world per capita. Metro Vancouver – 560 A-bombs worth of extra energy every day. One every 2 minutes. The energy from just one atomic bomb shocked the world when it exploded. For good reason as this footage from a Nevada test shows. It shows a house a mile away from the epicentre of a single atomic bomb blast like the one dropped on Hiroshima. The fossil fuels we have already burned in BC are increasing global warming by this much new energy every 75 seconds. In case you were curious, we literally can’t afford to pull our past CO2 out of the atmosphere. A study by the American Physical Society shows it costs $2,400 to reduce atmospheric CO2 by a single tonne. We have dumped over a trillion tonnes of CO2 into the atmosphere since Enola Gay dropped its bomb in 1945. It would cost $3 to remove the CO2 emitted from a single litre of gasoline. Our current BC Carbon Tax is 6 cents per litre. As the International Energy Agency recently said, the path humanity is on with fossil fuels is leading to "catastrophe." They said the costs to act now are many times less than the costs we face if we delay acting. In BC, our climate policies have proven to be inadequate to meet even our own undersized goals. We added a BC Carbon Tax with the plan to raise the price of carbon fuels and thereby discourage their use and so their CO2 emissions. Yet years later both gasoline and natural gas are cheaper now than before we added our carbon tax. In addition, BC said clearly that coal was too dirty to burn. Yet the extraction of our crown-owned BC coal is increasing. Almost all our too-dirty-to-burn coal also is allowed to evade our carbon pricing and our carbon accounting. Giant tar sands pipelines, each of which will pump out many times more carbon than all of BC's economy burns, are being fast-tracked through by our federal government. BC is becoming the doormat for a huge increase in tar sands carbon extraction. Extraction of carbon in the form of BC natural gas is also increasing with a surge of fracking. Big new pipelines, liquefying export terminals and super tankers are being shoved into the Great Bear Rainforest to get this carbon away from our carbon taxes and into our atmosphere as fast as possible. If we want to stop our metastasizing climate bomb from getting totally out of hand the science is clear that most of the carbon still in the ground needs to stay there. To do that, our carbon laws and leadership need to change course pronto. Nothing we are doing is close to adequate to the challenge. We are carbon binging in BC. We are pouring our economic future into a growing carbon bubble. "We are heading for a real crisis in which we’ll have to start ripping infrastructure apart."